Namaste! Relaxocean, association and sharing of wellness, invites you to three meetings with yourself. 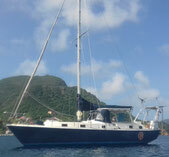 Enjoy massages and meditation, live simply on a boat and share the pleasure of sailing with other travellers. Relax: discover, receive or practice relaxation massages, reflexology, Janzu water healing, Yoga, meditation, Tantra. Xo: have a natural break in the simplicity of welcome, openness to other people, exchange with locals and friendship on a sailboat in marina or at anchor in a lagoon. Ocean: Participate in passion for sea and for sailing with kindness, freedom and respect for non profit spirit of boat pooling. Relaxocean is based on a non-profit billing system. This is a conscientious attempt to respect one other's feeling and financial means. To preserve the liberty and creativity of everyone. The activities are open to all wave lovers: waves of massages, hugs, consciousness and ocean. Welcome on board!